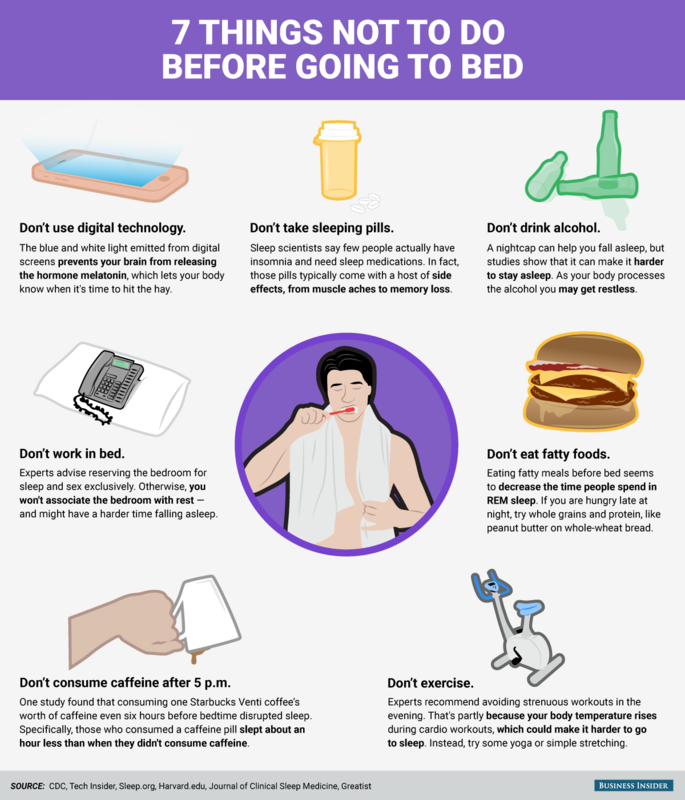 10 Worst Things to Do Before Bed : Why is having a good night’s sleep a very important part of our daily lives? Sleep is very crucial when talking about quality rest. The human body needs proper sleep in order to recover from daily activities such as doing exercises, going to work, cleaning your house, and other various activities. Not only does sleep help you recover physically, it also helps you recover mentally and emotionally. More often than not, there are various activities that you do right before bed that could vitally have different effects with your body: physically, internally and mentally. These little things that you do before bed are sure to have big consequences. It is very true that staying hydrated would definitely help your body while sleeping or resting, but some tend to drink too much water right before bed. Drinking up to eight glasses of water a day is said to be enough for keeping your body hydrated. Plus, having as little as one too many drinks right before going to sleep might cause you to wake up in the middle of night, rushing to head to the bathroom to pee, or in a worse scenario, not even waking up at all and ending up peeing on your bed. Eating 3 times a day is surely enough for an average person to last a day. Taking a light snack before bed is fine, as long as it isn’t anything fatty or greasy. Heavy meals should be taken at least four to five hours before lying down. You should also take note that your digestive system is designed to digest food with you having a vertical position, which means that it is advised for you to not lie down or go to a sleeping position after having heavy meals. Caffeine is a stimulant mostly found in tea and coffee products, and is sometimes also found energy drinks. The purpose of taking caffeine is to get your mind and body moving, which indicates that taking caffeine will make it harder for you to fall asleep. It also causes a delay in your body clock which leads to the reduction of your total sleeping time. Unless you have insomnia, sleeping pills should not be consumed without the proper prescription from a doctor or someone of medicinal knowledge. Plus, the use of sleeping pills, even if advised to do so, is recommended only for short-term use. Long-term use of the drug will eventually lead to your body being dependent, causing you to get addicted to it. Alcohol consumption is one big cause of different sleeping problems, one example being insomnia. While some consider other kinds of alcohol such as wine to allegedly help their sleep, studies show that it does not. Drinking alcohol before bed may also have the effect of lowering your rapid eye movement (REM) , which is an important factor for your memory and concentration. A lot of people are addicted to gaming. May it be addictive gaming on computers, consoles, or even mobile phones? People usually only have free time during night time before sleep. This might cause the temptation of opening your phone and starting any kind of game. Even if you’re just playing a little, there’s still a high chance of you getting too distracted and continuing to play all night long, effectively ruining your time of sleep. There is a very high chance that right before you sleep, you are tempted to check your various social media platforms. Avoiding gadget related activities before bed is a must if you’re intention is to fall asleep immediately. Getting engaged in this particular activity will most likely distract you from getting enough sleep. Texts, emails, chat conversations, calls, and even letter type conversations if not important, should be avoided before going to bed. Engaging in a conversation might make you stay up all night and distract you from having a good night’s sleep. So these last 2 examples basically mean that you’re phone or any other gadget should stay away from you when you’re lying down your bed. Horror movies were designed for scaring you and causing nightmares. This genre of movies should be avoided before going to bed. Side effects of watching scary movies include behavioral changes, anxiety, fear/phobia, and even mental trauma. Working out is an essential part of your day. In some situations, the only time you have left to work out is during night time. Even though going to sleep might become more satisfying if your body needs rest from working out, there should be a considered amount of time between sleeping and exercising. It is recommended to have your workout or exercise done three to six hours right before bedtime. Doing this will help with your sleep, maximizing the benefits that you will obtain from it. These examples are the most probable reasons of your lack of sleep. Always keep in mind that a human being’s body can only take too much and constantly needs an enough number of hours of rest each and every day. To get that rest, taking care of your body and sleeping habits by avoiding the said examples would be a great start. Previous articleRecumbent Bike Vs Upright Bike – Which Is Better?